This photograph shows one of the many shadows thrown by Lieve Jerger's Carriage of Lost Love, from our Lace not Lace exhibition. Images simply don't capture this exquisite piece that's 40-plus years in the making—you must see this work of art to truly appreciate it! WHEN: Sunday, Sept. 23, for Lace not Lace at 3 p.m., and includes gallery talks by Exhibition Curator Devon Thein at 4 p.m. and artists Jin Choi and Thomas Shine, at 5 p.m. Festivities will follow with live music and a food truck, and a special first lighting of the Urchins, one of the exhibition's main attractions, at dusk. The special limited engagement for Jin Choi + Thomas Shine’s the Urchins ends Oct. 7. Lace, not Lace: Contemporary Fiber Art from Lacemaking Techniques, reveals how lace makers are expanding the traditional boundaries of their art form to create exciting work that investigates contemporary themes, materials and forms. “This is the first show in the United States to focus on contemporary art made in bobbin and needle lace techniques,” said Devon Thein, an internationally known lace expert who is curating the exhibition. This special Hunterdon Art Museum exhibition features 41 works of lace art by 28 artists from around the world. Thein said she sought to create a show that demonstrated the versatility of bobbin and needle lace techniques. “I wanted to include artists who had been major figures in the lace revival of the 1970s, as well as younger artists who had benefited from their innovations and discoveries,” Thein added. The exhibition features a special two-week engagement of the Urchins, two lace orbs, each 15 feet in diameter, that will hang above the Museum’s Toshiko Takaezu Terrace. This exhibition marks the first United States appearance of the Urchins. Created by Jin Choi + Thomas Shine, Architects, the Urchins will be suspended from thin, almost invisible cables spanning trusses that are 20 feet high. More than 50 people dedicated three months to meticulously hand craft the lace shells that are held in tension over an aluminum frame. Gently guided by the wind and the touch of the visitors, the Urchins interact with natural light to create ephemeral shadows during the day and glow when illuminated at night. Another showstopper is Lieve Jerger’s Carriage of Lost Love, which the artist has spent more than four decades creating. The work is a life-size carriage made of copper wire using bobbin lace technique. The Carriage of Lost Love began with just one panel, the Traveler window. But that sparked Jerger’s imagination and compelled her to build a ceremonial carriage that has been a labor of love for many years. 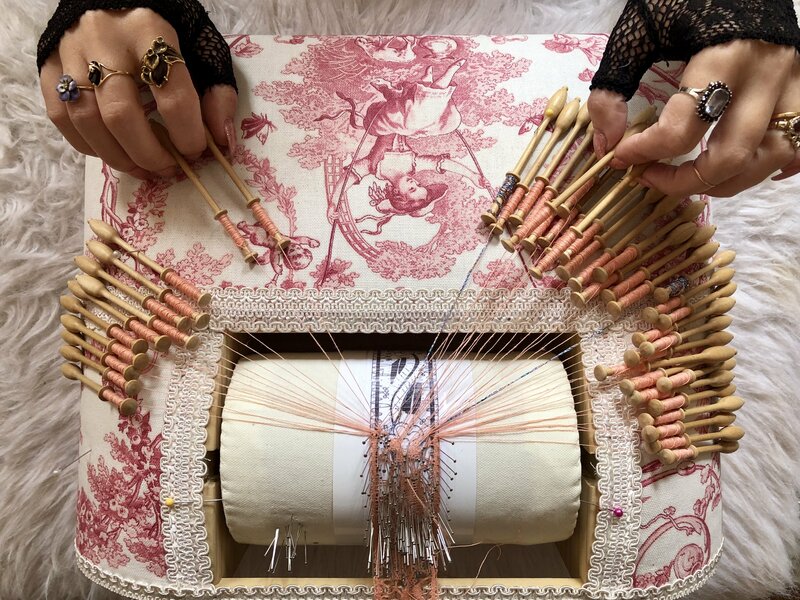 Artist Pierre Fouché works in a self-designed methodology combining bobbin lace with another historical lace technique macramé. In his triptych called Judgment of Paris after Wtewael, Fouché took web-based news images of male protestors, some from the Occupy Movement, selected for their classical poses. The exhibition also includes four pieces by Milča Eremiášová, a legend in the world of Czech modern lace. The pieces in the show were selected by Dagmar Beckel-Machyckova, a student of Eremiášová. Beckel-Machyckova now lives in the United States where she is pursuing her own career as a lace artist, and has a piece in the show. Other artists in the show are: Manca Ahlin, Jane Atkinson, Daniela Banatova, J Carpenter, Laura Friesel, Alex Goldberg, Maggie Hensel-Brown, Ágnes Herczeg, Ros Hills, Veronika Irvine, Nava Lubelski, Dorie Millerson, Penny Nickels, Jill Nordsfor Clark, Wako Ono, E.J.Parkes, Lenka Suchanek, Lauran Sundin, Olivia Valentine, Nicole Valsesia-Lair, Denise Watts, Louise West, and Ashley Williams. The exhibition runs until Jan. 6, 2019. The exhibition Lace, not Lace: Contemporary Fiber Art from Lacemaking Techniques is generously supported by The Coby Foundation, Ltd. Support also provided by The International Organization of Lace, Inc., the Provident Bank Foundation and Holiday Inn Clinton-Bridgewater. 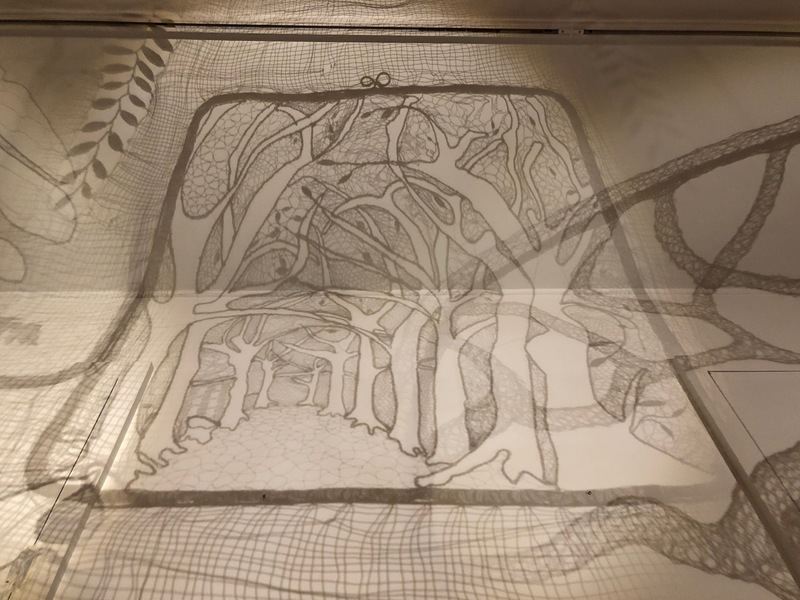 We have several Lace not Lace exhibition-related programs that you won't want to miss! Beginner Bobbin Lace Workshop with Elena Kanagy-Loux (Sunday, Nov. 4 at 11 a.m.): Try your hand at the traditional art of bobbin lacemaking in this beginner workshop taught by Elena Kanagy-Loux of Brooklyn Lace Guild! Students will learn how to wind bobbins, create a pricking, set up a pillow, and combine the foundational stitches of bobbin lace into a pattern. All materials provided. Register today! Guided Tour of Lace, not Lace: Contemporary Fiber Art from Lacemaking Techniques with Curator Devon Thein (Saturday, Nov. 3 and Sunday, Nov. 11 at 11 a.m.): Come join us for a curator-led tour of Lace, not Lace: Contemporary Fiber Art from Lacemaking Techniques! Curator Devon Thein will walk participants through this astounding show. Register today! Lace Artist-in-Residence (Sunday, Nov. 11 and Sunday, Dec. 9 from 11 a.m. to 5 p.m.): Drop into the Hunterdon Art Museum and get some valuable help with your lace art from Pat Morris (Nov. 11) and Laura Friesel (Dec.9). Free with your HAM admission. 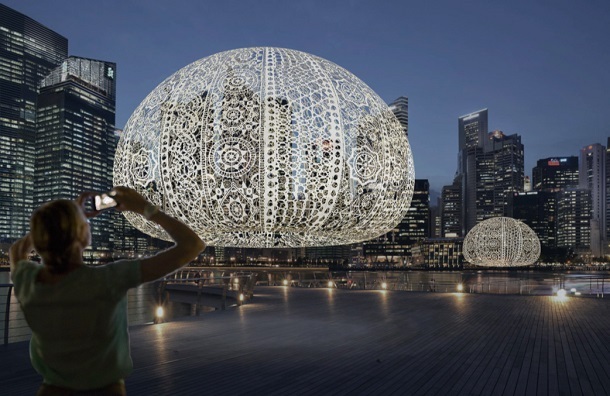 Image Top: Choi + Shine Architects, the Urchins, 2017, Crochet resembling reticella, 2.7 meters tall and 5 meters in. diameter. Courtesy of the artists.